Authorities arrested and charged a white Baltimore resident on suspicion of murder after he admitted to killing Timothy Caughman, a 66-year-old black man, in New York, police officials said this week. 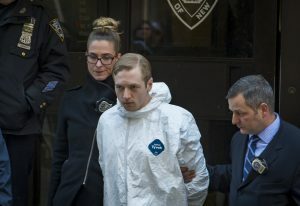 James Harris Jackson, 28, an Army veteran, fatally stabbed Caughman with a 26-inch sword, said New York Police Department assistant chief William Aubry told reporters at a news conference Wednesday. Aubry said police believe that Jackson’s attack on Caughman was “racially motivated” and that the suspect had been harboring ill feelings toward black people for more than 10 years. Originally from Baltimore, Jackson traveled to New York because “it’s the media capital of the world, and he wanted to make a statement,” police said. As far as authorities know, he did not attack anyone else. Police received a report Monday around 11:15 p.m. ET that a male victim had been stabbed multiple times by an unknown assailant following a dispute. The victim, who was soon identified as Caughman, walked into a nearby police precinct in Manhattan with critical injuries. After being transferred to Bellevue Hospital where he later died from his injuries, NYPD spokesman Lt. John Grimpel told the NewsHour. Caughman had stab wounds to the back and chest, and prior to the attack, he was collecting bottles, he added. About two days after the attack, Jackson turned himself in at the Times Square police station on Wednesday, Grimpel said. Jackson can be seen via video surveillance days leading up to the incident wearing a black coat, brown shoes and dark colored pants prior to the attack. “At this time, there is no connection of any crime involving their suspect here in Baltimore,” Smith said. “The NYPD will be here in town conducting interviews as part of their investigation to learn more about the suspect and possibly develop information about his motive for going to New York,” he added. New York City Mayor Bill de Blasio condemned the attack. “More than an unspeakable human tragedy, this is an assault on what makes this the greatest city in the world: our inclusiveness and our diversity,” de Blasio said. From March 2009 to August 2012, Jackson served in the U.S. Army as a military intelligence analyst, the Associated Press reported. He was also deployed to Afghanistan from December 2010 to November 2011. AP also reported that Jackson was discharged, but it’s unclear why. The NewsHour reached out to the Army for comment, but they did not respond immediately.